This rack was inspired by a design I saw on etsy (http://www.etsy.com/listing/66636810/wolf-den-coat-rack?ref=tre-418014206-10). I do like to support local artists and craftsmen when possible, but at $75, this was not an option for me at the moment. In addition, I had a couple of extra branches and wood laying around. And of course, as always, if it can be built, I will build it. I have been teaching my girlfriend how to do basic handiwork, and for this project, I largely instructed and supervised while she assembled it. She did most of the sawing, nailing, and assembling. I hope you enjoy this instructable, and if you do, please vote for me for the Maker Mom's by clicking "vote" above. table saw, miter saw, chop saw, or handsaw to cut the frame. Cut your branches to the appropriate height of your rack. I cut mine to be approximately 12''. Also, if desired, trim the ends of the branching sections where your coat will hang. Using your hand, miter, table, or chop saw, cut the boards to make the frame. My frame was approximately 8'' deep, 15'' long, and 13'' tall. Using nails or screws, attach the branches to the bottom of the frame first ( or top, the order doesn't matter). If you are using screws, it may be useful to pre-drill the holes first. After you have attached your branches to the bottom of the frame, attach the sides of the frame using screws or nails. Then attach the top of the frame. Secure the top of the branches to the frame with nails or screws. Sand off any protruding edges. Use wood sealant or varnish to protect your new coat rack. If you want a "vintage" look to it, you could try putting some dents in the side with a hammer or nail. The wood I used was already quite old, so I didn't have to do anything. Hang it up using the 2 hanging hooks (you know the 'as seen on TV' hooks). I found they are actually pretty useful and durable, especially when you don't have any studs. Besides a rack, this also serves as a shelf! This is a small prototype. Later on I may build a longer one. I hope you enjoyed this instructable, and if you did, please vote for me for the Maker Mom's Contest by clicking "vote" above. and feel free to ask me any querstions if you get "hung up" on anything. This Instructable is amazing and inspires me to create something for my sister-in-law's upcoming wedding. Her house is going to be very Deer and Country Cottage inspired so this is perfect. Great job on yours! Looks awesome! i gotta give credit for this a very very nice piece!!! I love this. So inspired. Simple magic. 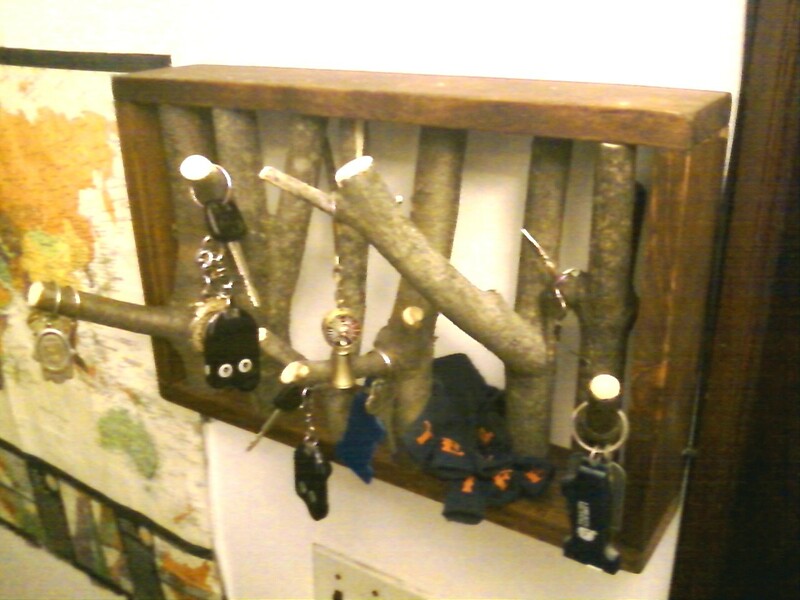 This is even better than the tree branch coat racks I've been envisioning for months now. I love it. Love the aesthetic...thanks for sharing! This is some thing I am going to make, what a neat idea. I am glad to hear. Post a pic of your finished product and any tips/mods you do! Nice, that looks really cool.